Mizuno is the leader in golf performance and customization. They’re all about performance and that’s why the name Mizuno brings high standards and the new irons for this year don’t disappoint. They’re adding two new iron sets to the game enhancement line (MP) and two to the game improvement line (JPX). Let’s take a look and see what’s new! Have you ever found yourself looking at more forgiving irons, but realized you didn’t want to sacrifice looks and take away from shot-shaping ability? The Mizuno MP-15 is the answer. The Mizuno MP-15 iron set is forged from a unique blend of multi-materials. No one else in the industry can do it. Mizuno takes the 1025 elite “pure select” carbon steel and titanium, and forges the materials together. Since the materials cool at different speeds the steel “wraps around” the titanium and “locks” it into place. Typically, when there are two or more materials used, companies weld them together, but with Mizuno, there are no welds or adhesives used on this iron. This is a rare feat and only Mizuno possess the capabilities to pull this off. The Mizuno MP-15 irons feature a Ti Muscle construction. This construction is based around a titanium muscle insert, which ultimately increases forgiveness and provides a solid feel at impact. 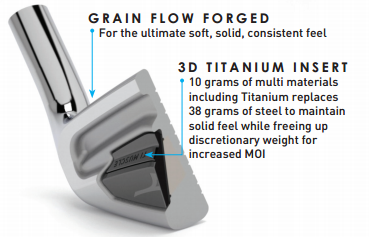 To fit the 3D titanium insert into the back of the club head, Mizuno needed to carve out space, and by doing so took out 38 grams of weight. 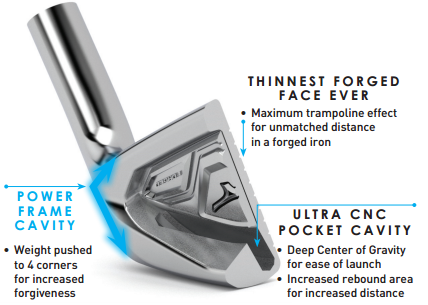 The 3D titanium insert only weighs 10 grams (because titanium is lighter than steel) allowing Mizuno to increase the weight in the toe and heel portions of the golf club. This discretionary weight increased the moment of inertia (MOI) by 10% versus the MP-64. The Mizuno MP-15 iron set is available in 3 iron through PW, with the True Temper Dynamic Gold as the stock shaft. However, there are other shafts available through custom options. Choosing any of the custom options won’t delay your next round either, as Mizuno hangs their hat on having the best custom option in the business, selection and time-wise. The Mizuno MP-15 will best suit players with a handicap between 0-4. Do you find yourself with long approach shots into greens that are firm and fast? Those conditions make it nearly impossible to put the golf ball close to the flag because it’s tough to hit long irons high and precise. Well, Mizuno has the iron set you’re looking for; the MP-H5. 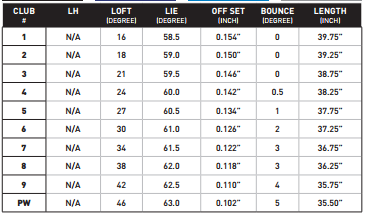 The Mizuno MP-H5 iron set has an aggressive flowing center of gravity (CG), sole thickness, and MOI. These design elements create high forgiveness in the long irons and control and workability in the short irons, which many players are looking for. The 1 (Yes, I said 1) through 6 iron feature a full hollow design. This construction creates a low sweet spot with a deep COG for a nice high launch. The 7 through PW feature a half hollow design, forged from 1025E carbon steel. 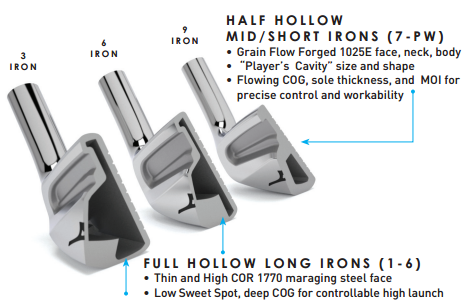 The combination of the half hollow construction and forged material will create a blended performance of high launch with a soft and solid feel at impact. 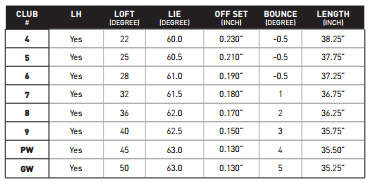 The Mizuno MP-H5 iron set is available in 1 iron through PW, with the KBS C Taper Lite as the stock shaft. However, there are other shafts available through custom options. The Mizuno MP-H5 will best suit players with a handicap between 0-8. Do you find yourself needing to upgrade to keep up with innovation, but you can’t make the switch because you need that traditional looking iron? Leave it to Mizuno to create a solution, and it’s wildly innovative, a first of its kind. The JPX 850 Forged iron is designed with Boron, that element you learned about in science class. The biggest buzz about the JPX 850 Forged iron is the Boron used during the forging process. It’s a new material that is 30% stronger than the traditional 1025E steel that Mizuno typically uses. This stronger material allows for a thin face, which produces extremely fast ball speeds for long distance shots. While the material is stronger and produces more distance, it simultaneously delivers that soft and consistent feel at impact that Mizuno is known for. The Power Frame Cavity gives the entire face the ability to flex at impact by pushing the weight of the iron to the 4 corners of the club for increased ball speeds and distance. The Mizuno JPX 850 Forged irons also feature a CNC pocket cavity. This creates a deep COG for a higher launch and increased ball speeds on the 4 through 7 irons, were you’ll need distance the most. The Mizuno JPX 850 Forged iron set is available in 4 iron through GW, with the True Temper XP as the stock shaft. However, there are other shafts available through custom options. The Mizuno JPX 850 Forged will best suit players with a handicap between 6-16. Do you find yourself lacking distance? The Mizuno JPX 850 is full of power! This iron is the longest iron in golf. The Mizuno JPX 850 iron set features the same Power Frame Cavity found in the JPX 850 Forged, but this iron set incorporates the Dual Max COR Pocket, and not the CNC pocket cavity. 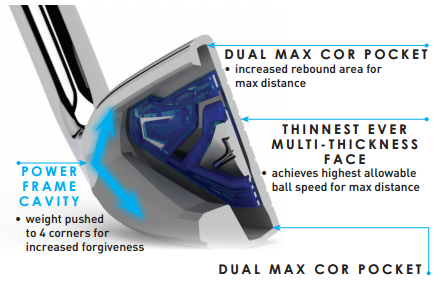 The Dual Max COR Pockets are located at the topline and sole of the golf club, situated behind the face and in the cavity of the design. These pockets increase the rebound area of the golf club for maximum distance. The JPX 850 irons also feature a Dual Relief Zone Sole which allows for ideal turf interaction from all variety of lies leading to solid ball striking. The Mizuno JPX 850 iron set is available in 4 iron through GW, with the True Temper XP as the stock shaft. However, there are other shafts available through custom options. The Mizuno JPX 850 will best suit players with a handicap between 8-18. Now that you know all about the irons, see the breakdown of the new Mizuno JPX 850 driver.